Benumof and Hagberg’s Airway Management new edition available! Looking for Benumof and Hagberg’s Airway Management? The authors have changed the name on the new edition! Aren’t they collegial taking turns on whose name goes first? 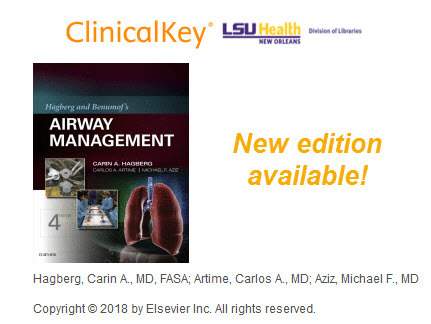 The 2018, 4th edition is now Hagberg and Benumof’s Airway Management, and we have it online through our ClinicalKey subscription. We also have the previous edition (3rd, 2012) online via ScienceDirect and in good ol’ fashioned print.